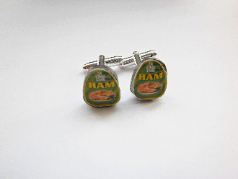 Handcrafted Ye Olde Oak Cufflinks. A popular food product used widely in 1930's Britain. * Due to the handmade nature of this product, sizes and styles may vary slightly from picture.